We are back. I can’t seem to nap enough. I took more than 200 pictures, and I will do my best to give you all the travelogue and editorial about my re-visit to alaska. So, we’re here. We made it. Can’t post much from the road, as few moments at a real keyboard are possible. But I am twittering madly from my phone. I’ll give you all the scoop when I get back home. Don’t forget about the summer solstice friends! This is the day. Mark it. A couple weeks ago, I had a bad start to the week. Nothing disastrous, I just hadn’t wanted to get out of bed. A metaphor, perhaps. Steep, meaning hard to climb. It was a monday that was hard to get through. Alright, that was was a bit of a riddle. The statement about the week having one foot in its stomach sent the poor recipient into a complete tailspin. I even TOLD him I meant a snail, but he was still listening to his own voice wondering what it could possibily mean and he didn’t hear me. I told him about three times before he got it. I believe I have a gift for describing things in unusual ways. I like describing things in unexpected ways. An adjective is fine, but I want to find an odd-jective to do the job. 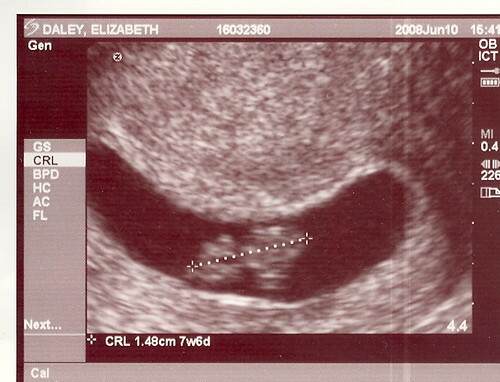 sonogram608, originally uploaded by murphy_h2001. This is the first photo of the new member of the Daley Family. Much better ones will be forthcoming, sometime after the child comes forth next year. That was an ordeal, but i figured it out all by myself. No emergency IMs to more experienced nerds, I did it. Perhaps it was partly because this new platform really is user friendly. Thank you for your patience, dear readers. After many trials with the move to a new server, I am trying a new platform for my blog. I hope this one works better. This site looks like heck. In other news, Chris turns 40 on Friday. I told him he makes it look good. I bought him a Fountain for our garden for his birthday. He’s pretty excited about it.